File Types: OTF,WOFF,All Files; File Size: 9.9 MB; Vector: Yes; Web Font: Yes. 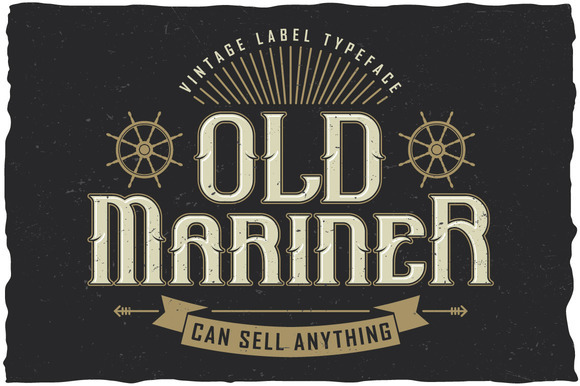 Here is a classic look label typeface named "Old Mariner". It's made in dynamic and vintage label style. Font is perfect for any labels design of absinthe, brandy, whiskey, rum,gin, beer etc. - EPS10 files with all graphics stuff from screenshots (without last photo). - OTF and WOFF font files. - 5 styles of font, named Old Mariner Regular, Old Mariner Stroke And Shine plus effect fonts named Old Mariner Stroke And Shine FX, Old Mariner Stroke FX and Old Mariner Shine FX. Keywords: decoration, dust, font, alphabet, western, rock, symbol, template, letter, graphic, old, element, card, typography, abc, type, label, emblem, modern, illustration, bottle, decorative, frame, retro, beer, absinthe, lettering, typographic, text, classic, set, poster, art, volume, style, vintage, background, logo, powder, gothic, ribbon, whiskey, bourbon, gin, alcohol, mystic, mystical, miracles, witchcraft, magica, typeface, design font, vintage whiskey font, bottle font, decoration font, cool font, stylized font, glass font, alphabet whiskey, drink font, sticker whiskey, glass of whiskey, whiskey font name, whiskey label font, vintage alphabet, whiskey tag, handcrafted font, logotype font, symbol font, alphabet font, whiskey label, sticker font, tag font, awesome font, vintage font, whiskey bottle, whiskey name, fine font, label alphabet, logo font, whiskey title, old font, label font, alcohol alphabet, name font, fine vintage font, title font, whiskey font, strong font, vintage whiskey, whiskey font title, retro font, whiskey drink, fine whiskey.